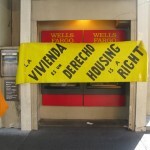 WHERE: 555 California Street, corner of California and Kearny, outside the corporate offices of Bank of America and Goldman Sachs. 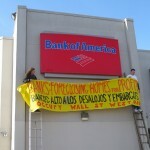 VISUALS: Giant squid illustrating Goldman Sachs as “vampire squid,” large banners. 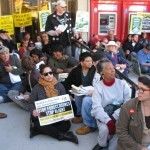 WHAT: Activists with Occupy Wall Street West will hold a press conference on Wednesday, January 18 to announce their plans to welcome in the new year with daylong protests and direct actions this Friday to disrupt business as usual for banks and corporations complicit in foreclosures, economic injustice, war profiteering and labor rights violations. 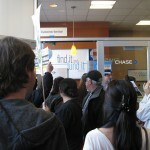 With dozens of affinity groups and over 55 organizations targeting specific banks and companies, this is predicted to be the largest street protest of the Financial District since anti-war protests in 2003. 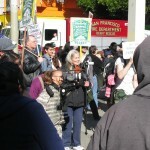 The press conference will feature speakers addressing multiple constituencies of the 99% such as students, Iraq veterans, anti-war, anti-corporate personhood and environmental activists, queer and interfaith organizers, workers, home-owners and tenants. 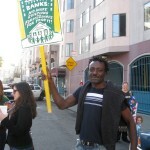 Featured speakers include R. Warren Langley, President (ret), Pacific Stock Exchange; and Vivian Richardson, a San Francisco homeowner who faced bank foreclosure (see bios below). 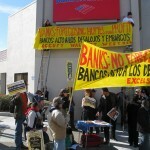 Occupy Wall Street West actions will target Wall St. banks and corporations complicit in attacking Bay Area communities, homes, education environment, livelihood, and democracy. 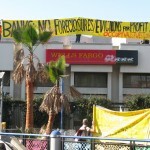 The activists demand that banks stop predatory evictions and foreclosures and an end to corporate personhood; and they aim to continue building and mobilizing a strategic mass movement asserting the people power of the 99% for economic justice and a better world. 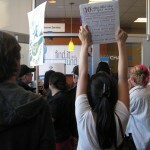 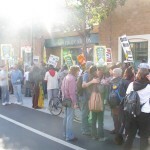 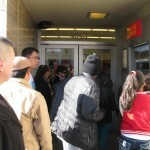 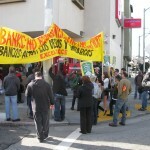 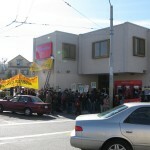 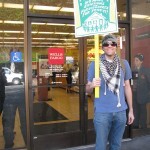 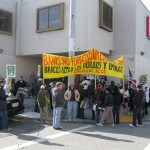 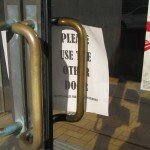 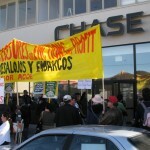 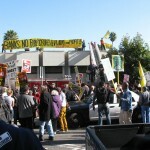 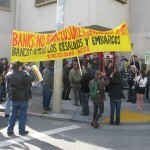 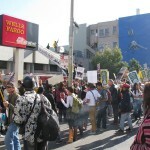 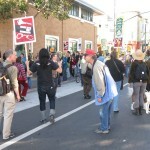 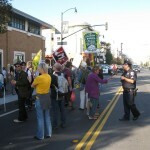 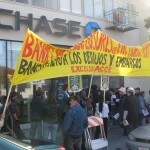 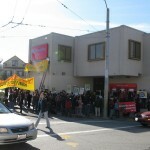 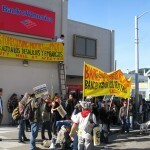 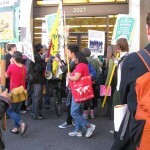 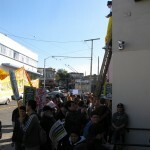 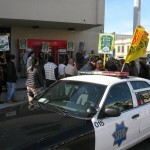 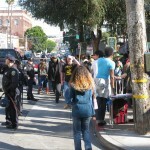 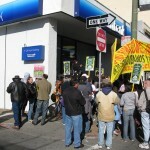 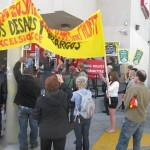 The January 20 Occupy Wall St West actions are the culmination of actions in which hundreds of protestors successfully shut down bank branches in the Excelsior, Mission, and Bernal neighborhoods. 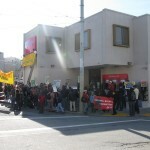 As part of the national January 20 “Occupy the Courts” day of action protests will include a demonstration against corporate personhood at the 9th District Court of Appeals in San Francisco. 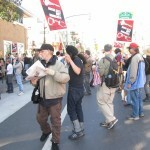 Timed to coincide with the opening of the stock market, Friday’s actions will start at 6am and will finish with a march starting with speakers and a flashmob at Bradley Manning (Justin Herman) Plaza and traveling to 555 California St. for a lively street party. 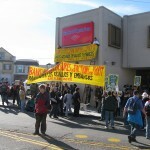 Warren Langley served as President and Chief Operating Officer of the Pacific Exchange in San Francisco. 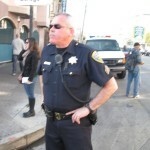 Prior to that, he was a Principal and Chief Operating Officer of Hull Trading in Chicago and is a U.S. Air Force veteran. 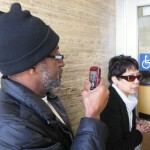 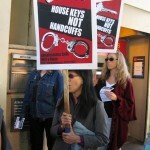 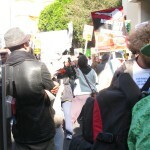 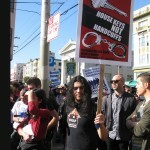 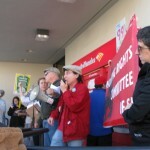 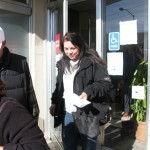 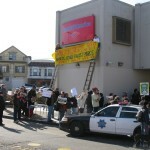 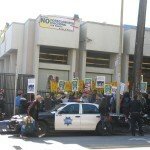 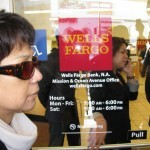 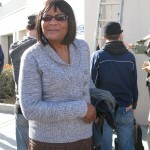 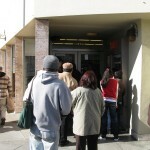 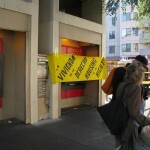 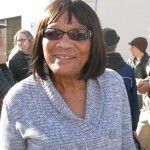 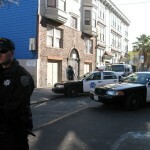 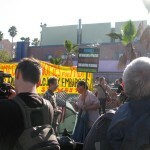 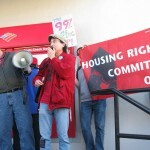 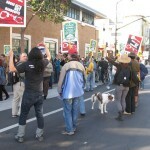 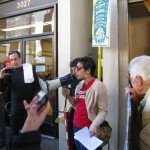 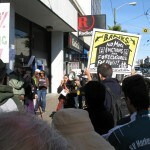 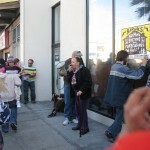 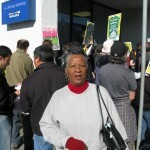 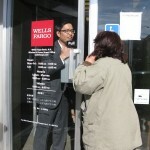 Vivian Richardson, a San Francisco homeowner faced bank foreclosure of her home with a December 31, 2011 eviction date. 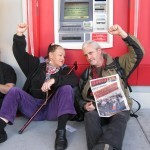 After public protest of the bank with neighbors, a community group and Occupy SF last November, her loan was modified and her home saved. 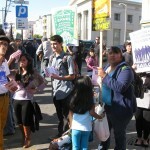 Over 50 additional organizations are participating in the Occupy Wall Street West Day of Action including: 28th Amendment Group, Ack-Act Theater, ANSWER (Act Now to Stop War and Racism Coalition), Alliance of Californians for Community Empowerment (ACCE), Asian Law Caucus, Bail Out the People Movement, Bay Area Labor Committee for Peace & Justice, California Nurses Association, Causa Justa: Just Cause, Coalition on Homelessness, Chinese Progressive Association, CODEPINK Women for Peace, Coleman Advocates for Children and Youth, Dancing Without Borders, Eviction Defense Collaborative, Filipino Community Center, Greenaction for Health and Environmental Justice, Homonomixxx, Housing Rights Committee, International Action Center, Jobs with Justice, La Raza Centro Legal—Day Laborer Program and Women’s Collective, Move to Amend, Move to Amend, Olympia, Mujeres Unidas y Activas, NationofChange, Occupy Bernal, Occupy Berkeley, Occupy MJC (Modesto Junior College), Occupy Oakland, Occupy SF General Assembly and Action Council, Occupy SF Housing Coalition, Occupy SFSU, People Organized to Demand Environmental and Economic Rights, People Organized to Win Employment Rights, Pride at Work, Pride at Work/HAVOQ (Horizontal Alliance of Very Organized Queers), Progressive Workers Alliance, QUEEN, Rainforest Action Network, San Francisco for Democracy, San Francisco Labor Council, San Francisco Tenants Union, SF 99% Coalition, SF Gray Panthers, SF Interfaith Allies of Occupy, SF-NOW, Workers World Party, Young Workers United. 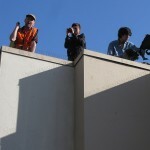 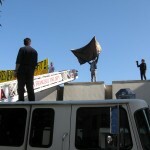 Update: Six protestors on the roof were charged with misdemeanor protest and released after a few hours detainment. 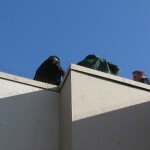 Montana was also released, but not until later and may face different charges. 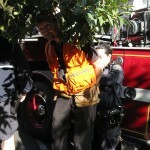 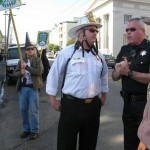 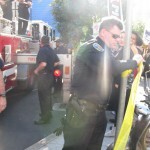 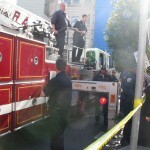 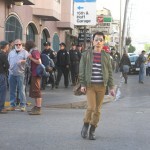 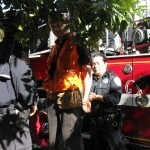 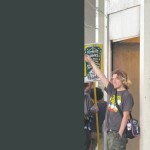 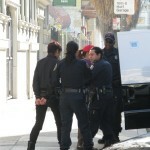 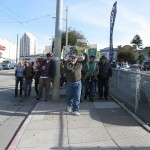 One other protestor named Blondie SF was cited and released for “walking illegally”. 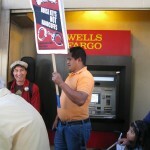 More than 200 protestors gathered for a rally in the plaza at Mission St and 16th St in San Francisco this afternoon to demand that Wells Fargo Bank immediately stop for-profit evictions and foreclosures. 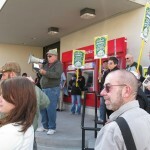 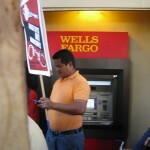 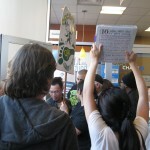 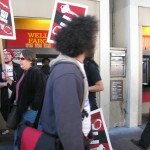 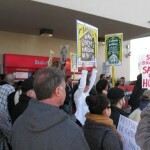 After hearing from several speakers, the group chanted and carried signs to the nearby Wells Fargo branch. 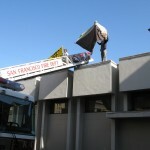 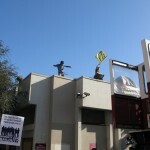 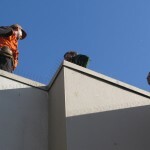 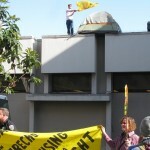 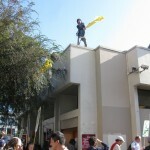 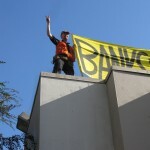 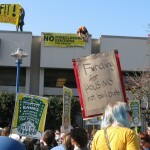 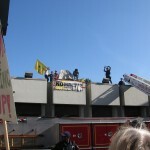 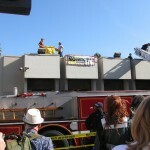 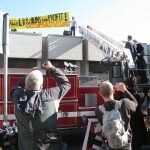 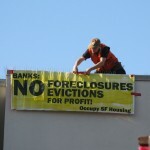 Some protestors managed to scale the roof and hang banners protesting evictions and foreclosures, as well as pitching a tent on the bank’s roof. 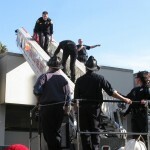 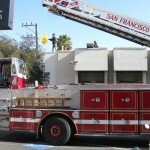 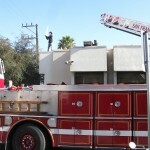 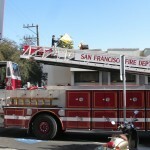 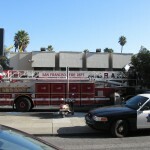 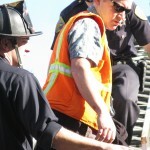 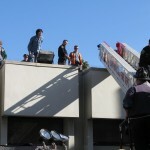 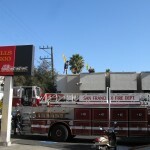 Police responded by calling the fire department, which drove a large fire truck into the bank branch parking lot and extended the truck’s ladder onto the bank’s roof. 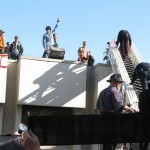 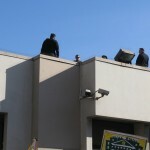 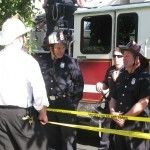 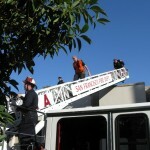 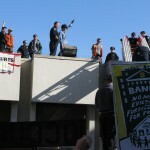 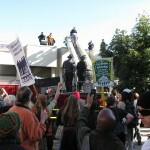 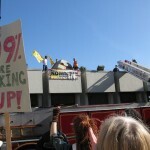 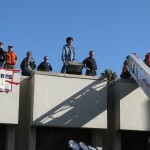 After negotiations between police and protestors which involved a dialog with the bank branch manager about setting up a meeting with Wells Fargo CEO John Stumpf, police told protestors they had to leave the roof. 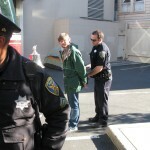 Protestors decided to cooperate and police cuffed and arrested at least four protestors. 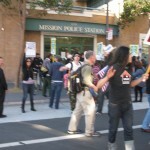 Protestors marched to the Mission Police Station in solidarity with the arrested protestors, the crowd blocking one lane of traffic on Valencia St. Police unexpectedly arrested at least one more protestor Montana, who plays the drum in the Brass Liberation Orchestra, for an unknown reason (possibly an alleged felony assault on a police officer), leaving two distraught children behind. 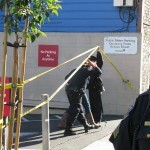 A friend of the person arrested took care of the children and brought them to the police station downtown to be reunited with the woman who is apparently their mother (hard to confirm the facts for certain). 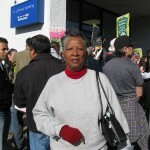 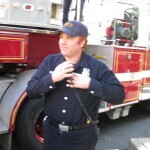 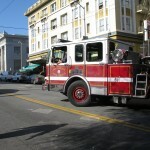 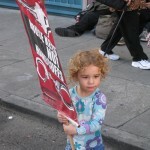 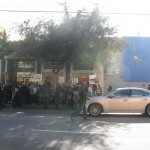 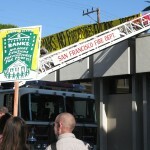 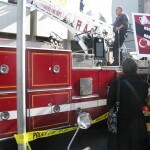 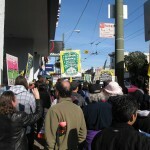 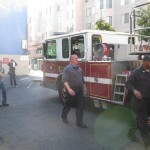 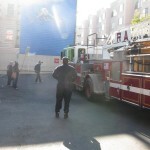 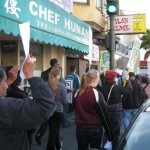 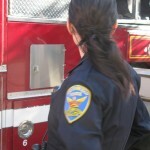 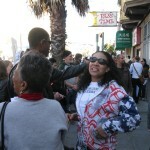 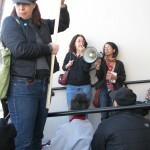 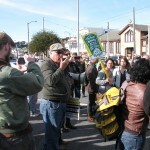 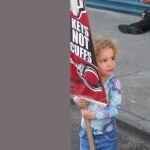 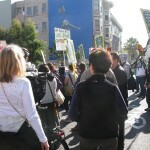 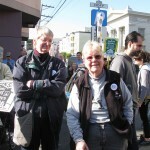 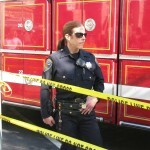 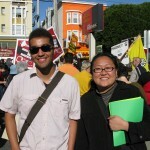 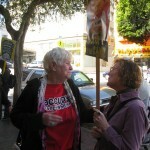 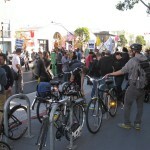 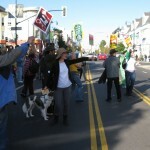 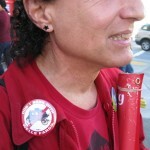 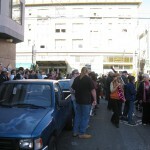 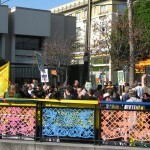 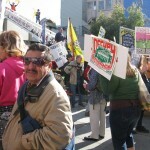 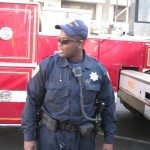 Folks are rallying for her at 12:30pm, Sunday, January 15, 2012, at 850 Bryant Street, San Francisco. 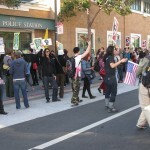 Gradually, most of the protestors left the police station, some to go to the police station downtown in solidarity with those arrested. 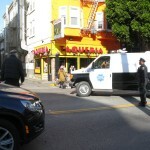 Update: more pictures from Krissana. 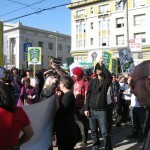 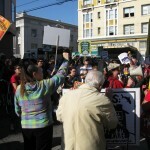 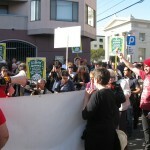 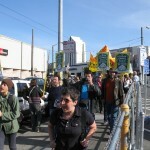 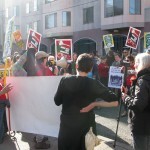 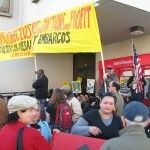 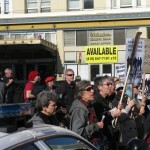 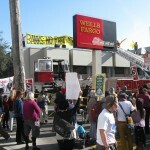 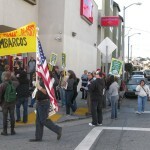 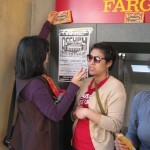 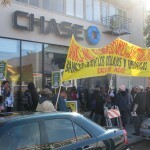 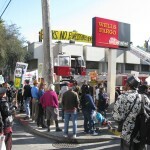 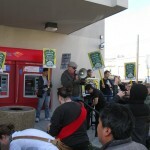 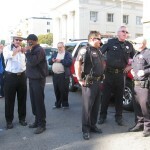 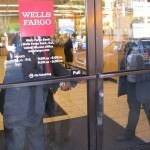 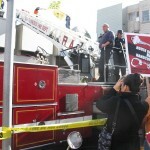 Here is coverage of the January 14, 2012, protest in the Mission district to stop Wells Fargo bank evictions and foreclosures. 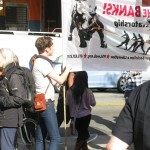 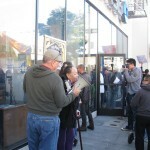 More than a hundred protestors today shut down four bank branches in San Francisco’s Excelsior district to protest bank evictions and foreclosures of home owners and renters in the Excelsior and beyond. 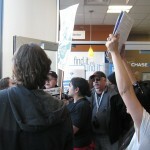 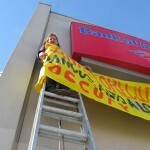 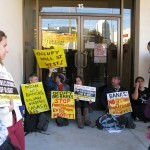 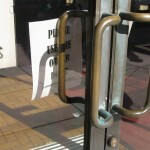 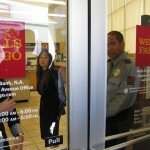 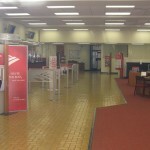 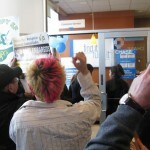 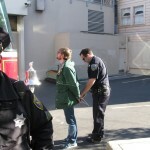 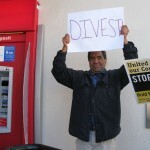 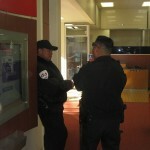 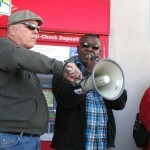 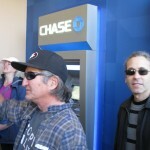 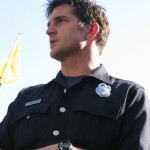 One protestor, Craig Rouskey, was arrested for refusing to leave the Bank of America branch as security closed the bank. 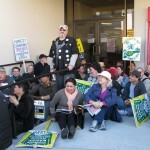 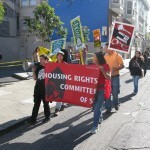 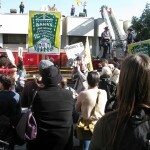 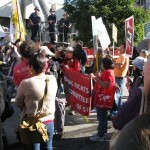 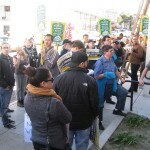 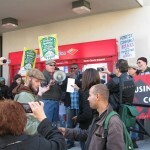 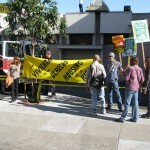 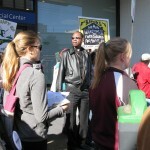 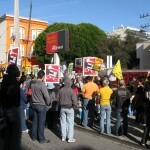 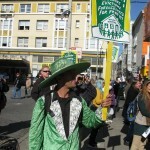 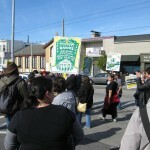 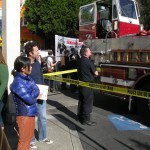 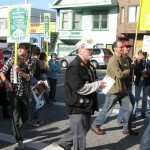 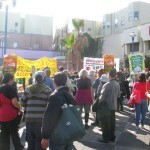 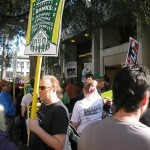 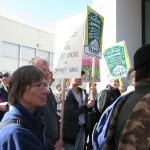 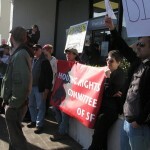 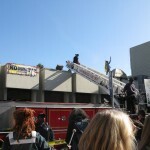 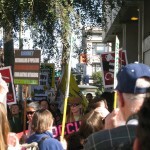 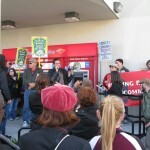 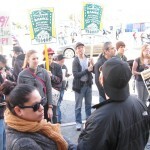 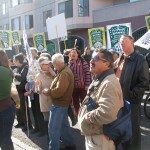 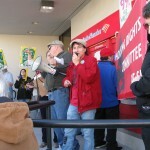 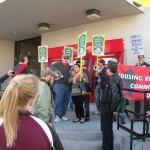 Thanks to ACCE’s Excelsior group, Occupy SF Housing, and Occupy Wall St West for organizing this action. 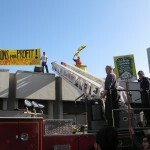 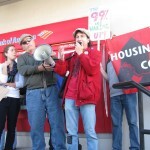 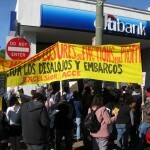 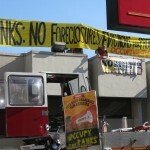 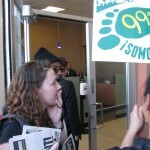 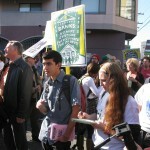 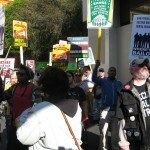 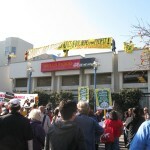 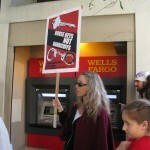 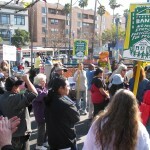 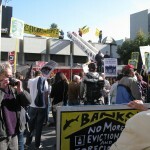 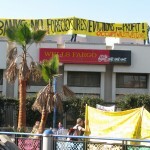 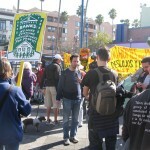 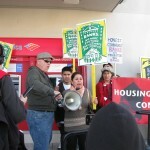 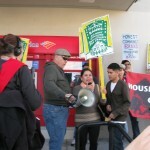 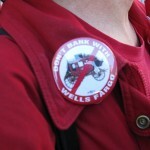 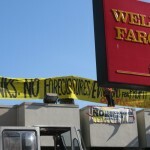 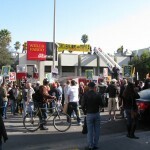 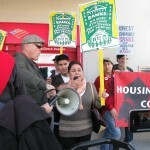 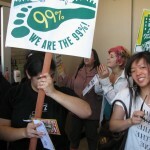 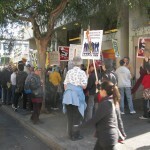 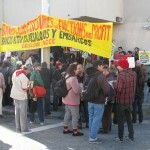 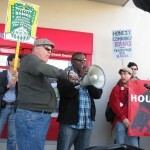 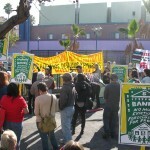 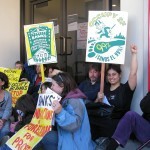 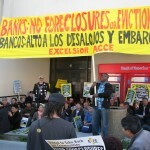 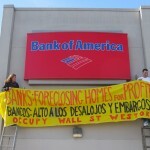 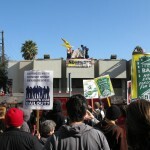 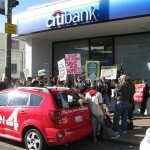 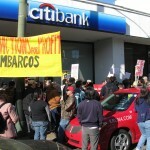 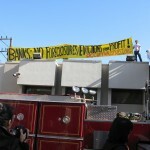 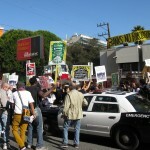 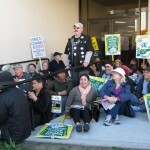 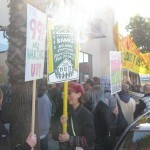 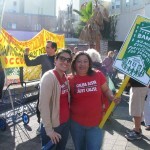 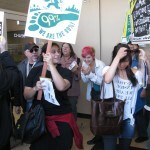 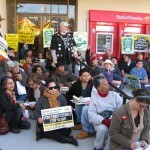 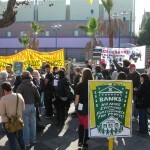 Run On The Banks: No More Evictions or Foreclosures For Profit! 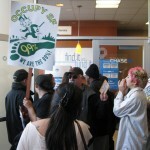 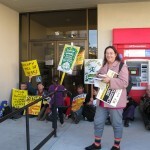 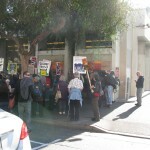 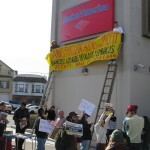 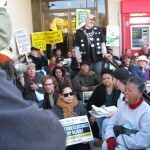 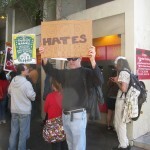 * 12:00-1:00pm, Thursday, January 5: Bank of America, 3250 Mission St.
Senior protestors from Occupy Bernal tell B of A to stop raising fees, pay fair taxes, and use the bailout money to stop foreclosures. 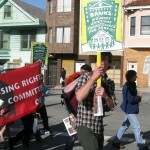 The banks evict thousands of renters and homeowners in San Francisco each year. 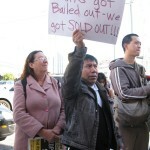 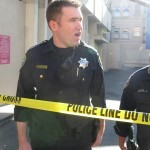 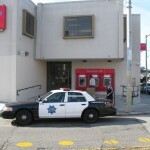 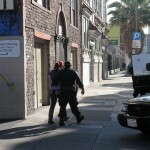 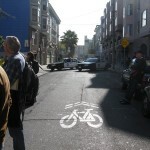 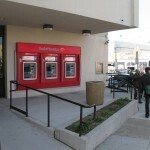 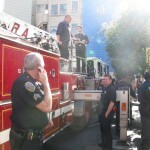 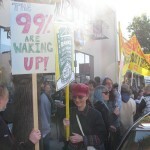 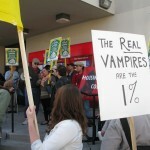 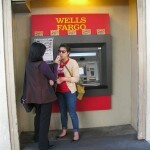 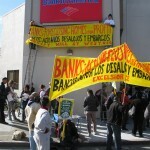 San Francisco’s Excelsior District has been especially hard hit by the wealthy 1% bank corporations preying on the 99%. 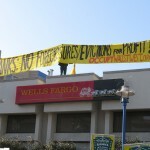 This action will protest evictions and foreclosures by Wells Fargo, Bank of America, and Chase, demand that the banks reverse evictions to get people back in their homes, and ask people of the Excelsior to withdraw their money from these predatory banks. 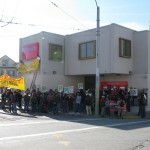 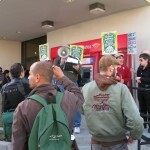 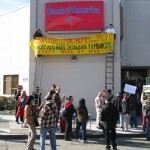 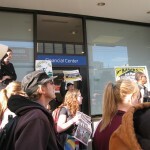 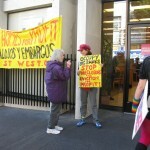 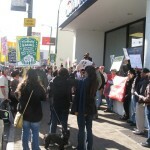 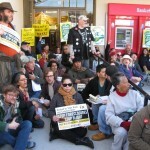 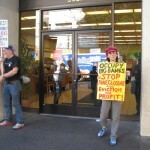 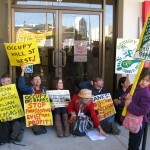 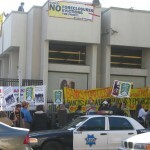 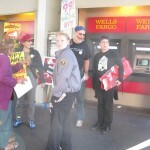 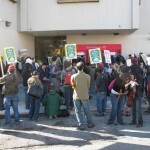 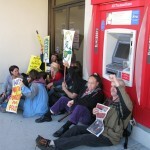 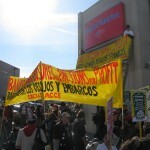 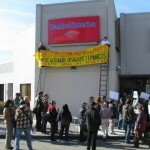 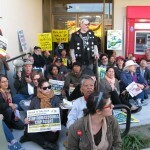 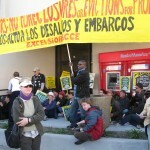 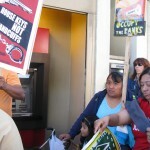 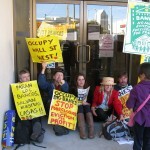 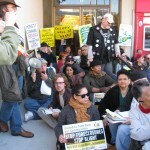 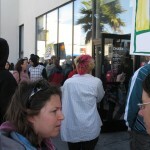 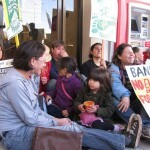 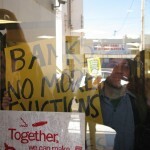 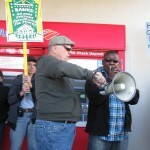 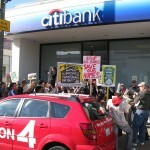 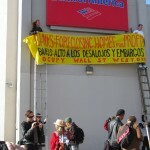 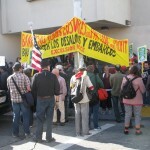 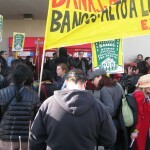 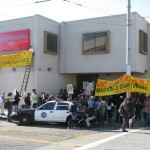 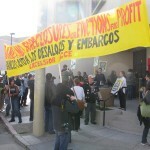 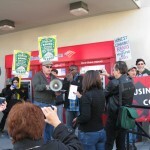 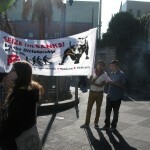 * 12:00-1:00pm, Thursday, January 12: Bank of America, 3250 Mission St.
No more for-profit evictions in the Mission District! 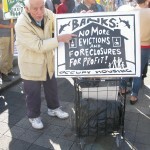 Occupy Wall St West actions to shut down the financial district’s banks and corporations most involved in evicting tenants and homeowners. 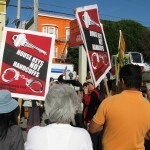 Occupy SF Housing is a coalition which includes Occupy SF, SF Tenants Union, Housing Rights Committee of SF, Causa Justa::Just Cause, Eviction Defense Collaborative, ACCE, Homes Not Jails and others. 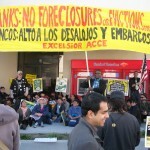 The coalition came together to stop banks from evicting tenants and homeowners from their homes through foreclosures or through their partnerships with real estate speculators. 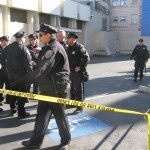 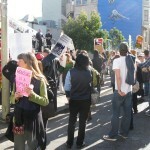 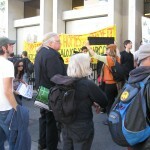 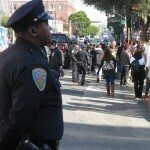 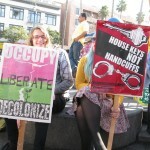 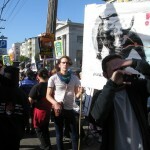 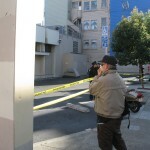 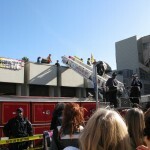 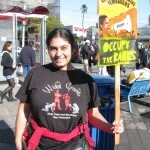 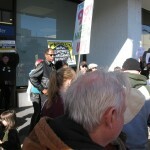 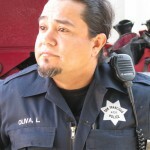 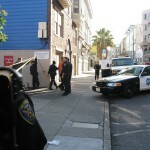 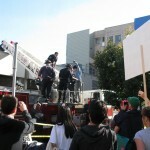 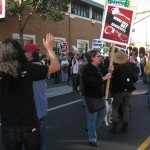 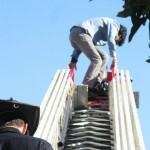 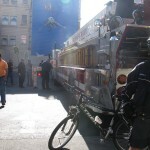 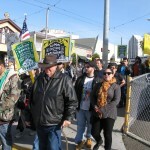 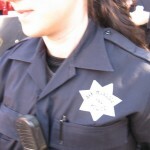 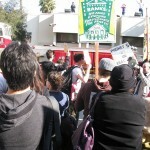 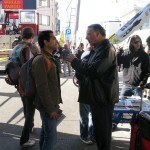 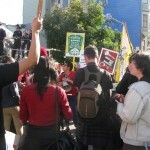 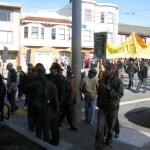 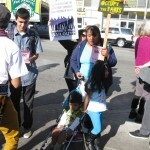 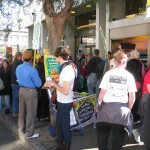 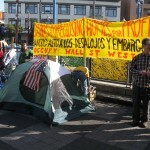 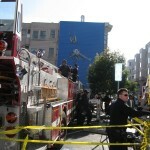 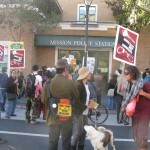 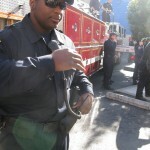 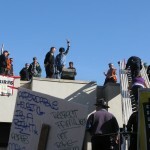 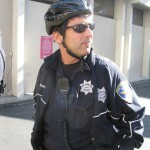 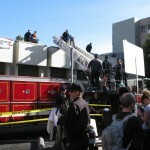 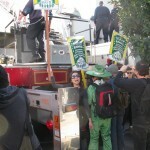 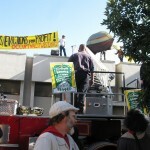 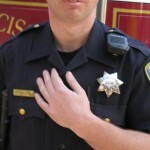 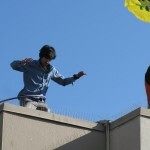 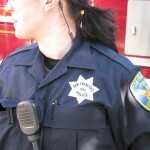 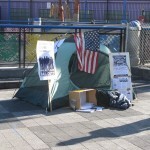 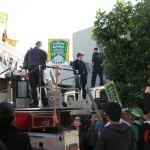 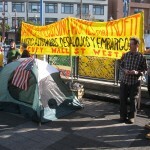 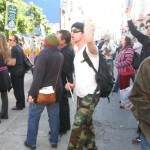 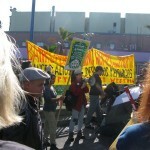 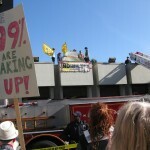 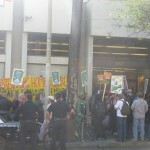 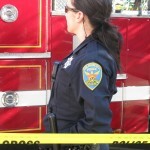 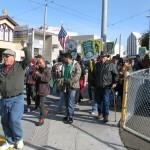 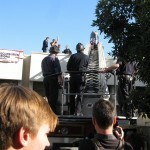 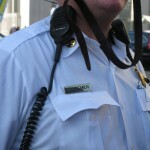 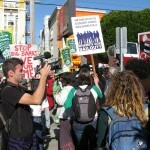 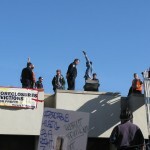 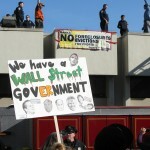 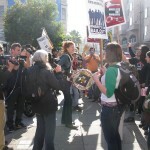 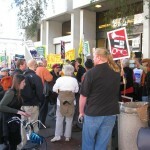 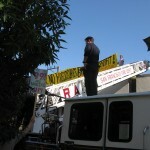 For more information, see http://www.occupywallstwest.org and http://www.occupysf.org.